Never diet again! Noom Coach is a personalized weight loss app specifically designed to help you develop better lifelong eating habits and lose weight for good. Unlike an ordinary food log or calorie counter, Noom Coach provides focused guidance and encouraging feedback – backed by science – to help you build healthy eating habits that last. MyFitness Pal stands out among the many food trackers available. It’s a robust app (or web based platform) that allows you to track food, water and exercise. It has over five million foods in its database that are simple to search. Not to mention, it also syncs with trackers like FitBit and Jawbone, as well as other fitness and wellness apps. You can connect with friends to stay accountable and it’s 100% free! You’ve heard of the book, right? The book quickly became a best seller; it taught us all how to make healthier choices with our food, whether dining in or out. Now, in app form, you can play the game and see how good you are at choosing the more nutritious and less fatty option from two similar foods. While it’s not a traditional weight loss or nutrition app, it’s addictive and a fun way to learn food tricks that will help you make better meal choices. Whether you want strength, cardio, or a combo workout, Nike+ Training Club has you covered. With over 100 workouts from Nike Master Trainers (including professional athletes and celebrity trainers) that range in time from 15 to 60 minutes, you will never run out of workouts! The workouts, designed specifically for women, can even be structured into workout plans to follow over an extended period of time. 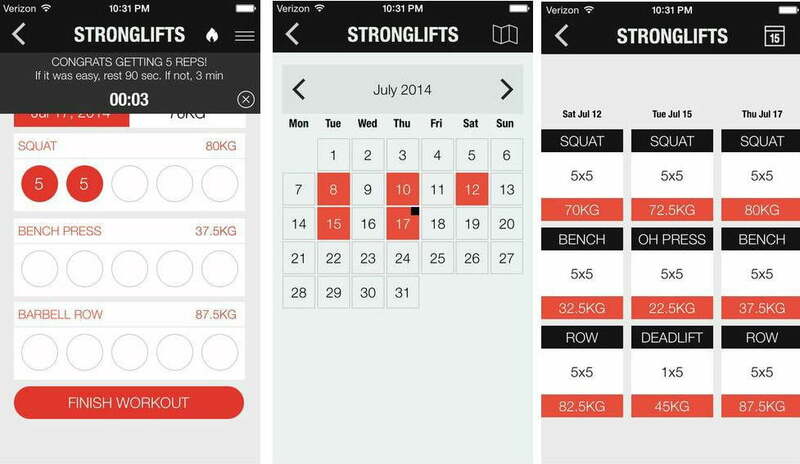 You can easily adapt the workouts to meet your needs, as well as your ability level. And … it’s free! The simplest, most effective workout to get stronger, build muscle and burn fat. Three exercises, three times a week, 45 minutes per workout. Thousands of men and women worldwide have used this StrongLifts 5×5 workout app to get stronger, build muscle or burn fat. Plus, it’s FREE! Looking for cardio inspiration? Load up Motion Traxx, jump on your favorite cardio machine at the gym and be amazed at how quickly the time flies by. Whether you love cycling, the treadmill, eIliptical or stepper, you’ll find awesome tunes with trainer led workouts layered on top. You can take advantage of a limited number of workouts for free, or invest $4.99/month or $34.99/year for unlimited workouts. Sleep is an integral part of your healthy lifestyle! And, this is by far my favorite app for tracking your sleep. Simply tell it what time you must wake up, place it in bed beside you and let the app go to work. It tracks your sleep and wakes you up within a window (that you specify) at your lightest stage of sleep. Waking up in a light stage of sleep allows you to wake up less tired and feeling refreshed. When you wake, you can see how long you slept, as well as the quality of your sleep. The music you wake to is soothing, there’s a snooze feature just in case you’re not quite ready to get up, and the app even provides sleep aid music that can fade out as you drift off! Wake up feeling refreshed; and you’ll make better nutrition and activity choices all day. It’s only $0.99. Map My Fitness is your one stop shop for tracking exercise, activity, nutrition, and more. The Map My Fitness community will help you stay accountable, as well. You can track your ‘gear’ to help keep track of when you need new shoes! The exercise database has over 600 activities to choose from. If you’re off for a run, a walk or a bike ride, the GPS tracker in your phone helps Map My Fitness provide accurate stats including mileage. It also connects with over 400 devices. If you go MVP, you’ll even find personal training plans, audio coaching, and Live tracking. The social side of Map My Fitness will allow you to be motivated and held accountable by a large network of people near and far. Of course, an app can’t make your food choices for you, so ensure you lace up your shoes and get out the door or sleep soundly… but, knowledge is power and measurement certainly equals motivation! Load up one or more of these apps on your smartphone and get to work.